As I type the word "summer", it almost feels a little wrong. With the weather we've been having, I've been fully ready to give the flip flops the flick and trade in the coconut-laced scents for something a little more cosy. I'm holding my hands up, I'm an autumn gal through and through. Summer comes a close second to being my favourite season, although it makes for a tricky one in the makeup department. Oily skin and summer aren't the closest of friends at the best of times. However this year my approach takes notes from both ends of the spectrum, as you will discover. Talking base, and as the weather has warmed up, the need for primer is ever the more pressing. I've recently switched back to the Benefit Porefessional (£24.50), which creates a smooth, matte base ready to apply foundation. I've been really into mixing my foundations this season, and *shock* I've been craving a dewy base. I know what you're thinking: oily skin plus dewy foundation equals greaser of the century, but including a super matte base in the mix allows you to go mad with the sheen, giving a soft focus look in all the right places, but without accentuating all the wrong places. The L'Oreal Infallible Matte Foundation (£7.99) has been perfect for this. Most people tend to need a darker shade in the summer: clearly not me, as I've found most of my bases too dark this season. Instead of forking out for whole new foundations, I've opted for the bargain £3 Makeup Revolution Ultra Face Base Foundation in their lightest, pink-toned shade. It not only makes my usual foundations more fitting to my skin tone, but it sheers it out slightly so nothing gets too heavy. The final ingredient in my dewy summer skin mix is the Origins Vita-zing Energy Boosting Moisturiser (£29 full size). A grey toned cream that turns to a tinted moisturiser on application, this adds a bit of glow to the skin. On its own, both the shimmer and orange tones are a bit too much, but it really comes into play when combined with my usual base products. For oily skin, a hefty dusting of powder over the T-zone is crucial to ensure only the bits you want to glow, glow. The Bourjois Healthy Balance Powder (£8.99) is really quite growing on me. It isn't too dusty and is smells like peaches and mangoes. Who can argue with that? It's been 2015's most puzzling beauty trend, but I'm really getting into the whole strobing thing. 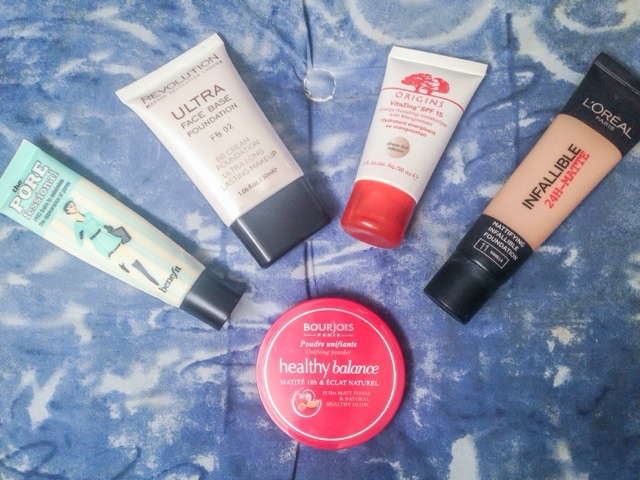 It is particularly great for those with oily skin to add a dewy glow. Concentrating the glow to one area means you don't have to compromise coverage over your oily areas. 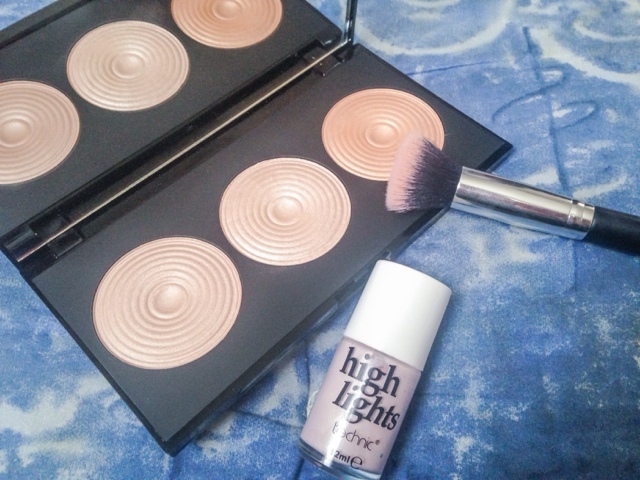 I've particularly liked using a liquid highlighter, such as the Technic High Lights (hello Benefit dupe!) dotted onto the cheekbones and up towards the brow bone in a sweeping C shape. I buff this in with a stippling brush, then sweep a highlighter, like one from the Makeup Revolution Radiance Palette (£8) for a soft focus look. I haven't been going too mad in the lips department this year. Usually summer calls for a pop of bright pink or coral, but I've been keeping it simple with a slick of my new holy grail lipstick, Rimmel Kate Moss 45 (£5.49 | Review). I've also been keeping things really subtle on the eyes with this look. I'll pop on a quick slap of a gold or peach toned shadow like the Boujois Colorband (£5.99) or MAC All That Glitters (from £10), then curl my eyelashes to within an inch of their lives and go in with about fifty coats of mascara. 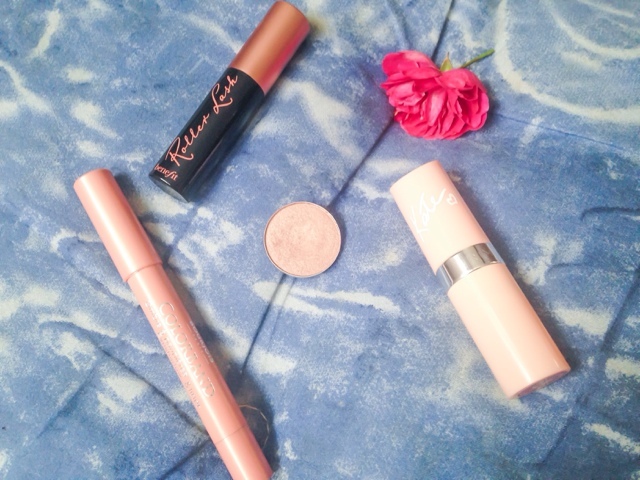 I'm back to using Benefit Roller Lash (£19.50 | Review), which gives a lovely, defined look. Are any of these in YOUR summer makeup bag?